Home Diseases and Conditions Alzheimer's Disease CAN COCONUT KETONES PREVENT AND TREAT ALZHEIMER’S? I also mailed her a package containing some supplements that support brain function and a bottle of Brain Octane Oil, the kind of MCT oil I use in my butter coffee every morning. “JUDY, (husband’s name) IS SHOWING IMPROVEMENT!!!!! THANKS FOR YOUR INTEREST & HELP!!!”! You may have heard that sugar is the body’s preferred fuel because whenever it is available, it is the first thing to be burned. Dr. Jay Wortman explains that this does not mean sugar is the best fuel for the body. It is burned first because the body does not like it and needs to get rid of it as quickly as possible, either by metabolizing it for energy or converting it to body fat and putting it in storage to be used if and when food becomes scarce. But for most of us, the hard times never come and we live, year in and year out, with a high level of sugar and the large amount of insulin necessary to deal with it. Metabolic Syndrome, the inability of the body to properly metabolize glucose, is to blame for many of our modern plagues, including type 2 diabetes, obesity, Alzheimer’s Disease, and Parkinson’s, among others. Alzheimer’s is now often called “diabetes type 3” because it is characterized by the brain’s inability to access glucose for fuel. Fat phobia altered our Western diet to be lower in natural fats, especially saturated fats, and higher in inflammatory, polyunsaturated fats and sugar than any ever documented in the whole of human history. The recent disclosure of historical documents from the 1960s has exposed how the sugar industry paid three Harvard scientists to conduct a review of research on sugar, fat, and heart disease. Their report, published in the New England Journal of Medicine in 1967, minimized the known links between sugar and heart disease and shifted the blame to dietary saturated fat and cholesterol, a belief that shaped the first set of nutrition guidelines and continues to dominate medical practice to this day. Everything that has gotten worse in the past 50 years can be traced back to the time when the U.S. government and health agencies first instructed us to cut down on fat and eat more vegetable oils and carbohydrates. In addition, the widespread use of statin drugs that artificially reduce cholesterol has, no doubt, exacerbated the problem. The brain is made up mostly of fat and contains more cholesterol than any organ in the body. The brains of people suffering from Alzheimer’s disease have become insulin resistant making them unable to access glucose for fuel so the neurons start to die of starvation. Luckily, the brain has an alternate energy source, one that actually makes it function better. Even a brain that has lost its ability to utilize glucose retains the capacity to use ketones, a byproduct of burning fat. The neurons start to regenerate once they are given this alternate source of energy, the one that is truly the brain’s preferred fuel. Ketones are naturally increased by fasting or by eating a low-carb/high-fat diet but there is another way to deliver ketones to the brain that works even when carbohydrates are not severely restricted. This brings us to the subject of medium chain triglycerides or MCTs. Most fats require bile from the gall bladder before they can be digested, but MCTs go directly to the liver where they are converted into ketones. The ketones are immediately released into the blood stream where they cross the blood/brain barrier and become available to nourish the brain cells. Ketones power the mitochondria in cells, speed up metabolism, facilitate digestion, promote fat burning, reduce hunger, and improve focus and mental clarity. “Further, this is a potential treatment for Parkinson’s disease, Huntington’s disease, multiple sclerosis and amyotrophic lateral sclerosis (ALS or Lou Gehrig’s disease), drug resistant epilepsy, brittle type I diabetes, and diabetes type II, where there is insulin resistance….Ketone bodies may help the brain recover after a loss of oxygen in newborns through adults, may help the heart re­cover after an acute attack, and may shrink cancerous tumors.” – Dr. Mary Newport. Notice: Whole coconut oil is less potent than the extracted MCT oils. Individuals tolerate MCTs differently and brands of products may vary from one to another with some being more concentrated than others. It is generally recommended that you start with a small amount when taking extracts and increase it over a few days until you reach the therapeutic dose of one to two tablespoons per day or the amount recommended for the product you are using. Consult a health care provider for additional information. MCT oil is colorless and neutral in taste and since it is liquid at room temperature, it can be used as cooking oil (up to 325 degrees). It can also be used in salad dressings, dips, mayonnaise, soups, ice cream, desserts, and many other recipes. One of my favorites is the simple chocolate pudding below. Place gelatin in a medium bowl or Pyrex pitcher, add the hot coffee or water, and stir until completely dissolved. Let stand until just warm. Stir yogurt or kefir into gelatin mixture until smooth. (If the mixture is too hot, it will kill the beneficial microbes.) 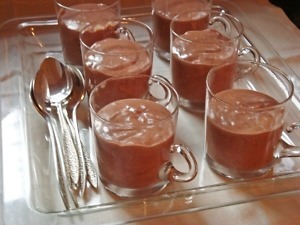 Blend liquid sweetener into gelatin and yogurt mixture. In a second bowl, whisk cocoa powder, collagen, sugar substitute with bulk, and salt together until well blended. Add dry ingredients to wet and whisk until smooth. Split vanilla bean and scrape seeds into mixture or add vanilla extract, if using. Whisk in MCT oil. Pour into serving dishes or leave in mixing bowl. Refrigerate until firm and serve. This sets up very quickly. 1- *To preserve the beneficial living organisms in the yogurt, don’t use a vanilla that contains alcohol and don’t heat the pudding after adding the yogurt. 2- Do you know which foods have the highest levels of antioxidants? Chocolate, coffee, and some spices. For comparison, wild blueberries have an ORAC (Oxygen Radical Absorbance Capacity) of 9,621; raw gogi berries have 3,290. Chocolate’s ORAC value is 55,650. Coffee has between 15,000 to 17,000. This article first appeared in the September, 2016 issue of Low Carb Direct Magazine. Disclaimer: I am not affiliated with any company and have not received free samples of any of the products mentioned above. Chocolate, Collagen, Kefir, MCT oil. Bookmark.